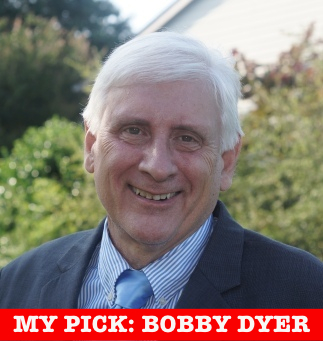 You can vote for Bobby Dyer, former Marine, PhD, college professor, home-care physical therapist and City Councilman with a long history of voting his conscience, holding down taxes and working to save Oceana during the last round of base closings. Or you can vote for Ben Davenport, one-term councilman, who attended community college for a time, with a thin resume and a war chest of $382,866 as of last week. (According to the Virginia Public Access Project, only $2,433 came in donations of $100 or less.) On top of that Davenport is claiming credit for excellent Beach schools and safe streets, points of pride that occurred mostly during Dyer’s tenure. Not his. I’m voting for “Bobby D.” If you care about good government, you will too. Some might argue that even in the largest city in Virginia, the position of mayor isn’t important. After all, we have a city manager form of government. The mayor is just one vote of 11. True, but the person who sits in the mayor’s seat sets the tone for the city. And Virginia Beach can set a new tone with an honest, independent mayor. Not a puppet of the local plutocrats. Dyer is a guileless man. A blue-collar kind of guy, despite his impressive academic credentials. He’s raised $53,685 in campaign funds this time, far less than his opponent. Frankly, he may not need hundreds of thousands of dollars to sell himself to voters. Folks already know and trust him. Dyer was a vocal opponent of light rail, something the overwhelming majority of Beach voters also opposed. He’s also been the council’s liaison to the Human Rights Commission and the Minority Business Council. Dyer says he wants a “level playing field” in Virginia Beach. And he means it. “We have to change that culture of arrogance,” he added. If elected, Dyer says he’ll push for an Ethics Oversight Commission to oversee all business dealings by the city to ensure that everyone is treated fairly. That sort of talk worries some of the folks flooding the other campaigns with cash. The governor’s right. And I know how we can do it.